The usual rounds of riot duty and sectarian murders are interrupted when a wealthy couple are shot dead while watching TV. Their son jumps to his death, leaving a note claiming responsibility. But something doesn’t add up, and people keep dying. Soon Sean Duffy, Belfast’s most roguish detective, is on the trail of a mystery that will pit him against shadowy US national security forces, and take him into the white-hot heart of the biggest political scandal of the decade. You know when you pick up a book that’s a few into a series, with a character you’re unfamiliar with and you get that jarring sense that you’re out of your depth and can’t get into things? Well, that certainly wasn’t the case here. Book four in the series featuring Detective Inspector Sean Duffy, Gun Street Girl, was a really easy in for me into his world, and within a few pages I was there in 1985 Belfast alongside him, loving the whip-crack storyline and the equally fast and furious one-liners. If Raymond Chandler wrote 1980’s set Irish crime thrillers then I think Sean Duffy is exactly the kind of cop we’d have got, pithy, ironic and humorous as he goes about his work. 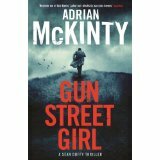 Gun Street Girl is quickly paced and soon encompasses many nations in its plot, as well as bringing into play an American character which I’m pretty certain was named in jest after another great Irish crime author. Great stuff and another crime author for me to now backtrack and seek out his other work, both in this series and in his other novels – I have some catching up to do with Adrian McKinty. 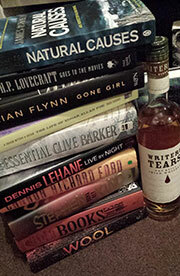 And you can grab Gun Street Girl HERE.